Cu resto altour de soun couder, se ré nou gagno, ré nou per. 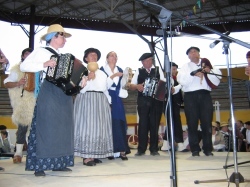 Born from "l'Amicale des Groupes Folkloriques Landais" created in 1968, the Confederation of Landes Folk Dance Groups (FGFL) counts more than 850 members through its 17 folk dance groups nowadays. 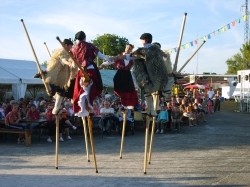 To introduce folklore landais, to favour its image, to accompany groups from the Landes in elaboration, appointment, promotion, presentation and evolution of their shows, such are the FGFL objectives. for the leaders of groups, on administrative plan. 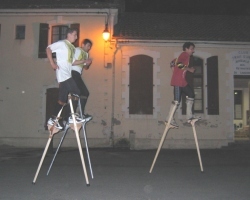 FGFL organizes sprints races for people on stilts during summer and long raids Translandes at the end of October. Finally, every year, at the beginning of the autumn, it is the master of work of the gathering of her members, which notably gives rise to a special show, opened to all publics.